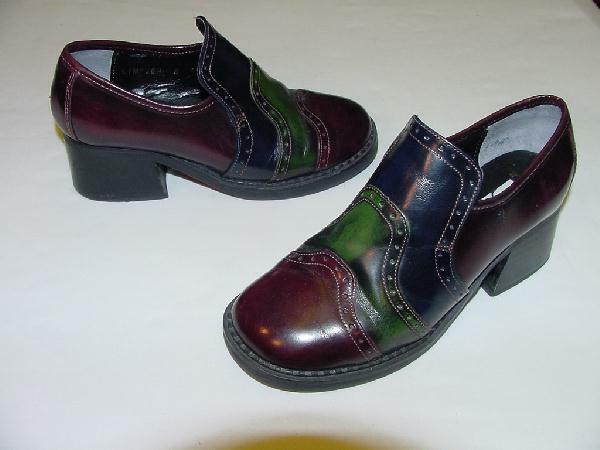 These wide toe slip-on shoes are burgundy, grass green, and midnight blue. There are decorative perforations and stitching across the vamp, which extends over the instep. They have chunky heels, and the bottoms of both heels show some wear and some scuff marks. These are great shoes for school or evening wear, and they won't give blisters since they've been broken in. They were from a stylist's collection, and were used in several catalog photo shoots.